Strawberry Chic: Pleated Pants ? ? ? Pleated Pants ? ? ? I've been a little skeptical of the new fashion trend of pleated pants. It seems like only yesterday that using the words "pleats" and "pants" in the same sentence could have gotten you thrown in fashion prison. Though, I will admit that I have seen some women who can pull the look off. In fact, I don't think that anyone could deny that Audrey Hepburn looked fabulous in pleated pants (but then again she could look good in just about anything). I just am not sure if I can pull it off. Personally I have tried to stray away from the "long-bottom" look but maybe some sort of tie or belt would help motivate me to try them out. I cannot say if I will adopt this new trend or not, only time will tell. I actually hated skinny jeans when they first came out and now they are basically all I wear. Considering a major pregnant body change is on it's way, I will refrain from purchasing any pants unless they are maternity pants. What do you think? 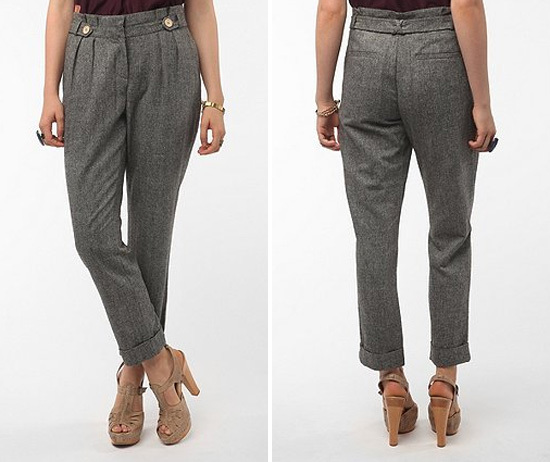 Do you own a pair of pants like these? Would you ever? I have to say I'm not a fan. I also avoid that long bottom look and that is the first thing I think of when I see these pants! You must try these pants. They are somewhat pleated, and I love them!! Plus, they are perfect for fall. I think you have to be pretty skinny to wear these pants. Pretty sure my big booty needs some pockets to help hide some of it! Did you ever see the SNL "mom pants" skit? Hysterical! That's what these remind me of. Never say never. Ugh. Ick no way! One thing I don't want to do is draw more attention to my middle lol.